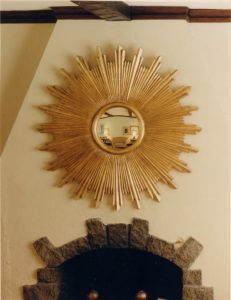 Bursts of fully sculpted antique gold leafed rays radiate a fiery light from an inner convex mirror. As Seen in House Beautiful magazine. Previous Post:#0032 Featherburst 38″ diam.